The Hemis Festival, which is slated to run from June 23 to June 24, 2018, brings energetic dance routines and sacred plays to the top of the mountains. Tibetan monks perform the "Masked Dance" at the Hemis Festival in Ladakh, India. Photo credit: Editorial credit: WATHIT H / Shutterstock.com. Indian culture is an amalgamation of many unique cultures, both ancient and modern. One of the best ways to learn and experience such cultures is through participation in the numerous festivals that are held in the country year-round. Some of these festivals, like the Diwali, are celebrated throughout India. There are other events whose festivities are limited to a particular ethnic community, region, or locality in the country. One such festival, the Hemis Festival, despite being held in a remote monastery in Ladakh, has managed to attract the attention of tourists and media throughout the globe. This year, the Hemis Festival will be hosted by the Hemis Monastery in Ladakh on June 23 and 24. The Hemis Festival is an annual religious celebration hosted at a Tibetan Buddhist monastery, the Hemis Monastery. It is located in Hemis, Ladakh, in the Indian state of Jammu and Kashmir. Ladakh is a land known for its surreal and dramatic landscapes. Its culture and history share close ties with that of Tibet. Ladakh is located on a plateau with an elevation of over 9,800 feet in most parts. The region extends from the Kunlun Mountain Range to the lofty peaks of the Great Himalayas. The harsh climate and rugged terrain render it one of the most sparsely populated regions in India. Every year, tourists from India and abroad visit Ladakh to admire the region’s remote and rugged beauty and rich culture. The Hemis Festival serves as an additional draw for visitors as it allows them to acquaint themselves with regional customs, traditions, and beliefs. Although several monasteries dot the landscape of Ladakh, the Hemis monastery is regarded to be the most powerful and the wealthiest in the region. It is an ancient monastery that is believed to have been established in 1630. It belongs to the Drukpa Lineage of Tibetan Buddhism. Principles of Tantric Vajrayana Buddhist tradition are preached here. The monastery is a treasure trove of ancient Buddhist art and artifacts like gold and silver statues, murals, sacred thangkas (Tibetan Buddhist scroll paintings), and more. The place is also associated with a number of legends that have shaped the religious beliefs and customs of the locals in the region for centuries. The Hemis Festival held at this monastery celebrates the birth anniversary of Guru Padmasambhava, also known as Guru Rinpoche. He is regarded as the founder of the Nyingma tradition, one of Tibetan Buddhism’s four major schools, and the oldest of the four. Guru Rinpoche is believed to have been born in the 8th century on the 10th day of the lunar month of the Tibetan calendar. This means that festival dates are decided on the basis of this calendar and usually fall around June or July every year. The timing corresponds to the summer months in Ladakh when the region is most accessible to tourists. The Hemis Festival displays the vibrant local culture of Ladakh. The celebrations are held in the courtyard of the Hemis Monastery. The festival is attended by national and international tourists, locals, as well as Buddhist monks who sit at the edges of the courtyard to watch the memorable spectacle. Locals prefer to adorn their vibrant traditional attires during the festival. The monks in charge of the festival arrange for the ceremonial unfurling of the sacred tapestry bearing the image of Guru Padmasambhava. Ceremonial items like cups containing holy water, incense sticks, figurines, and more are also carefully laid out on an elaborately hand-painted Tibetan table. Music is an integral part of the festival. The monks play drums, trumpets, cymbals, and other indigenous musical instruments. The sound of the traditional music fills the air of the monastery. 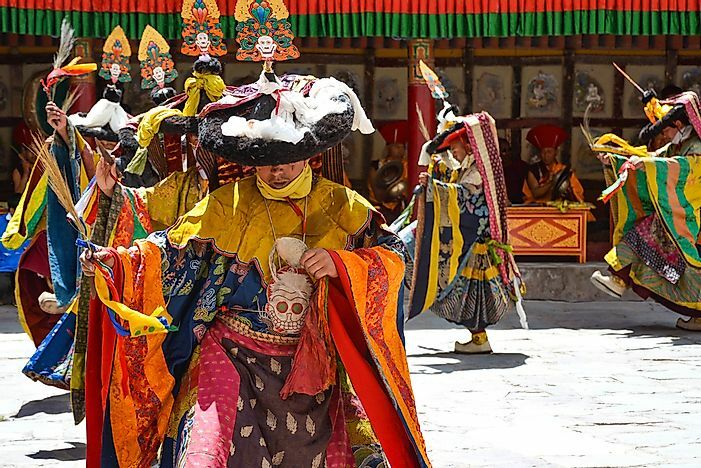 The most important event of the Hemis Festival is the “Chams”, or the mask dances, and the sacred plays performed by the monks. A riot of colors fill the courtyard of the monastery as the performing monks enter the stage. Cameras start clicking as the elaborately dressed monks begin their performance. Their colorful, traditional garments and massive paper-mache masks attract all eyes to the stage. The sacred dances and plays performed by the monks display a combat between good spirits and evil demons as mentioned in ancient mythological stories and folklore. The sound of the music in the background lends drama to the scenes enacted on stage. In the end, cheers and claps from the audience indicate that the devil's idol (made of dough) has been struck down by the leader of the Black Hat dance. It is a clear sign that good always prevails over evil.